Slimming World Diary: Body Magic? ..
Today was meant to be a body fitness day, gym and swimming. Unfortunately things went wrong, 40 mins into the gym session I was feeling sick, maybe I had done too much already or not had enough water. I think mostly though it was because we went early and I hadn't eaten. This is my downfall, no breakfast. Admittedly I have never had breakfast, it is not something that sits well with me, but now I'm being active more and having longer days maybe I should invest in it? So that was the gym cut short but then we went forward onto the swimming pool, unfortunately that did not go as planned either, only half of the pool was open so we couldn't really do lengths or for Gareth's sadness we couldn't go on the flumes. So all in all a pretty poor day for body magic, but I know I'll get 50 lengths in at the pool on Monday so looking forward to that. When I got back it was time for dinner, not really planned anything today so it was pretty much throw something together. 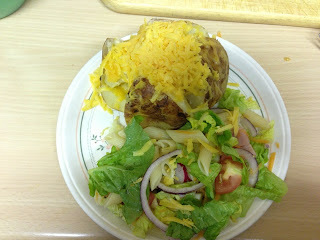 I decided on ham pasta salad with a jacket potato, I haven't had Healthy A today so I used that on cheese for JP. Sometimes its just really easy to throw a salad together for dinner, can be really filling and depending on what your vital ingredient is can be really flavourful. And don't forget completely syn free!